Well, it turned out that what we discovered in our last blog entry was just the tip of the iceberg! We went out to sea on Thursday with the wind blowing and the forecast for the winds to remain strong all day. We were going on gut instinct (and a big dose of hope) that it would be better than forecasted and were right! We had good conditions and found a large group of right whales east of South Wolf Island- 20 miles north of where we usually see them. And one of the pressing questions of this season (Where are all the mothers and calves?) was answered! We had 7 calves in one day and most of the mothers had not been seen yet this season. Another one of the questions may have been answered as well. I wrote about the whale Tips in post #7 and wondered why we see him only once a season when he comes to the Bay of Fundy. Well ... Tips has been seen repeatedly off East Quoddy light on Campobello, New Brunswick for the last week. One of the whale watch boat captains says he has the latitude and longitude written down and goes there daily to see him. It is rare for a right whale to show such specific site fidelity. Maybe Tips really likes this northern area and has been spending his summers in this area where we rarely survey. But as each question is answered, new ones come up. Why are many of the whales so far north? The last time many right whales were this far north during the summer was back in 1980 and 1981--nearly 30 years ago! It almost certainly has to do with the distribution of food, but we are not equipped aboard the R/V Nereid to do the necessary oceanographic sampling to determine what has changed. On Friday, we had an unusually broad picture of right whale distributions. We had 40 right whales in this northern area, the R/V Callisto had another 20 whales in the middle of the Grand Manan Basin, a whale watch boat had 15 right whales to the west near Grand Manan Island, and our research team on Roseway Basin south of Nova Scotia had 20 whales there--nearly 100 whales in a single day! Last night, dinner was small and quiet; the reason is because half our team has gone! Yesterday morning at 4:30 a.m. half the team woke up and drove to Bar Harbor, Maine where they then caught a ferry to Nova Scotia. Once in Nova Scotia the team met up with the captain of the boat that has been chartered to conduct surveys out on Roseway Basin. Roseway Basin, an area located approximately 25 to 30 miles south of Nova Scotia. Roseway Basin is an important summer right whale habitat and we were fortunate enough to have funding this year to conduct surveys of the area for a short period of time over the summer. While the Roseway team is offshore, without Internet access, we will be able to update you with some ongoing news from Roseway Basin since we will have daily communication with them via satellite phone. In the mean time with half the team gone and a thick blanket of fog cast over most of the Bay of Fundy the remaining team took advantage of a quiet house to catch up on some work. However, with the extended forecast not looking favorable for the next few days we all were starting to feel a little frustrated. However, just after lunch the house received a call from a friend who owns a local whale watch boat. "Right whales just off White Horse Island" I heard Philip say. It was with excitement that we jumped at the chance to get on the water. The whales were only about half an hour from our dock which sure beat our typical two hour commute to work whales each day. We joked about how nice it was to be heading down to the boat at 12:30 p.m. instead of our typical 5:30 a.m. departures. We quickly arrived on site and chatted with a few local whale watch and recreational boats that were also very excited to see right whales so close. Many of the whale watch boats that operate locally don't venture far offshore into the Bay of Fundy and typically sight many minke and fin whales so it was a great treat for them also to have right whales within their vessel's range. We ended up documenting a mom/calf pair (Catalog #2791 and her calf) and a single whale a bit further to the east ("Tips" Catalog#1124). You can search for more sighting data and photos of these individuals on the North Atlantic Right Whale Catalog. Amy chatted on the radio to the whale watch boats about the IDs of the whales while I recorded data and Philip and Candace photographed from the Nereid's bow. Today we sit in again in the fog and wind, with the forecast remaining much the same for the next few days. A few of us are holding onto a small amount of hope that tomorrow could turn out to be a day on the water while others just find some comfort in the fact that we got on the water yesterday even if for a short amount of time. 1) Catalog #2791 and her calf swim close to shore as onlookers get a rare treat. We are all in the house processing this season's data as Hurricane Bill approaches from the south. Luckily the forecast of 45-55 knots (52 to 63 mph) has diminished to 30-40 knots for Sunday. Still no weather to be at sea, but less dangerous for our boat in the harbor. Meanwhile, we will all settle in and match whales. We have identified 57 whales so far and there are some interesting stories among them. There are a number of big, old males here and one of them, "Tips" (Eg #1124 in the North Atlantic Right Whale Catalog), has a particularly unusual sighting history. Seen most years from 1980 to 1991, he disappeared for nine years before being re-sighted off Massachusetts in 2000. He hadn't been seen in the Bay of Fundy for 16 years until he visited in 2007. Now, he seems to come in for a single day each year and then moving on. We will be curious to see if that pattern continues this year; I suspect we will not see him again until next August. Another interesting story this year involves the mothers and their calves. With the record calving of 39 calves this year, we expect to see a lot of mother/calf pairs in the Bay this season. We did see seven of them early in the season, but have only seen two in the last 11 days (the most recent unusually close to Grand Manan island). While it is not uncommon for the mother/calf pairs to be somewhat segregated from other whales, it is unusual not to see them at all! Are they still here but not in the broad box that we survey? Have they moved on to another area? And, with the exception of the mothers, why are all but three of the adult whales in the Bay big males? With a few days of bad weather ahead of us, it will be a while before we can continue our surveys and collect the necessary clues to potentially answer these and other questions. Stay tuned! 3) The calf of #3440 off North Head, Grand Manan. Upon our annual migration to Lubec, Maine we find ourselves reunited with our "Fundy Family." For the eight weeks of the season we all live together at the field house. The field house was built at the turn of the century. The house was owned by the Mulholland family for generations and was at one time divided to accommodate two families. It's great fun to listen to the local townspeople reminisce about the people who lived in this house long ago. Since the Aquarium has owned the field house, we have turned a living room into our main office, a back kitchen into an equipment room and closets into bedrooms. The house has kept it's charm with its original heating registers from the 1900s, antique wallpaper, and hardwood floors. We have made minor improvements such as bringing in internet service, remodeling the kitchen and replacing the 57 windows to protect the house during the harsh Lubec winters. As with any old house, there are a multitude of home improvement projects that we work on as time allows. The real fun is the dynamic of 9 full-time researchers and many visiting researchers living in the house together. During stretches of long weather, we buckle down in the house and set to work, doing photo analysis and matching the whales we've seen in the field. On these days in we tend to mill around the kitchen alot. Our volunteer cook, Betty, has to chase us out of the kitchen so she can get dinner ready! While living and working together can be challenging at times, it also comes with the benefit of having a built-in family dynamic. We lean on each other in tough times, celebrate each others achievements and take off in troupes for hikes, bike rides and soccer. At the end of the day, we all congregate in the kitchen for dinner. Dinners can vary from an "intimate" dinner between the 9 full-time researchers to a large, boisterous gathering of over 20 people. No matter how many are in attendance, dinner is always a lively event with great food, stories from the field (present events and past) and lots of laughter! August is proving to be a great month for surveys. We were able to get out the past three days! The winds were light Wednesday and Thursday and sighting conditions were excellent for surveying the bay. Conditions Friday were not as nice; the sea was calm in the morning, but quickly picked up early in the afternoon. Luckily, we were close to home when the weather turned sour. 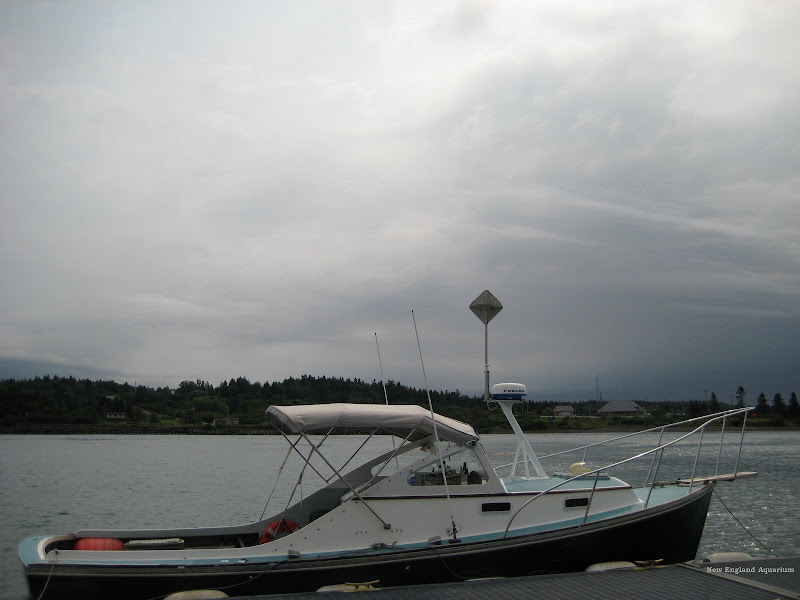 The ride home through the Grand Manan Channel was wet, but short and we made it to the dock at 2:30 p.m. The Bay was as calm as a lake both Wednesday and Thursday. At one point Amy took a picture of her reflection in the water while the boat was moving. Such calm conditions allowed us to cover a good portion of the bay. We surveyed the southern part of the bay as far east as the shipping lanes. On Wednesday, we sighted a lot of right whales near the shipping lanes and noticed an oil tanker in the outbound shipping lane. Moe radioed Fundy Traffic and notified them of the presence of right whales in the area. Fundy Traffic responded immediately, notifying the oil tanker of the whales position. We were all very pleased with how quickly Fundy Traffic responded. There seems to be a lot of activity in the bay this year. Thursday, we sighted 14 humpback whales, 27 right whales and 407 harbor porpoises! That's quite an improvement compared to the 2 right whales we saw on our first day out. To date, we have sighted 33 individual right whales, which includes 7 of the 39 mother and calf pairs seen in the southeast calving grounds this past winter. The weather is marginal for the next couple of days. We are watching the weather forecasts closely and hoping for the winds to drop low enough for us to get out on the water. Stay tuned for more posts about who we've sighted and more exciting stories of our adventures in the Bay of Fundy! Tuesday's first boat day was a good shakedown cruise even though only two right whales were found. The survey was extensive covering much of the Critical Habitat area. We learned, for whatever reason, that there were few right whales in the Bay of Fundy this year on August 4, compared to many whales at the same time last year. Wednesday and Thursday turned out to be office days for the Team. The two days ashore gave us time to get all the boat and office systems running smoothly, not to mention time to get our personal gear in order. By Friday morning the weather looked good and the well tuned Team and research vessel, the Nereid, were off at 6 a.m. to find if any of the other 400 or so known right whales had settled into the Bay of Fundy for their summer forage. As soon as we began the regular transect southward, hugging the east side of Grand Manan Island, we came across whales, humpback whales. Although the Team's mission is to survey for right whales, there are other research teams surveying humpbacks and the Aquarium Team photographed these three to send the images on to the Center for Coastal Studies in Provincetown, which maintains the photo catalog for humpbacks. Symbiosis is a process that pervades the science world, and research teams often help each other out when it does not impede their own work. Two hours later we started spotting right whales, and three were documented in the southern part of the survey area. No more whales were seen until well after noon. By then we were surveying in the northern part of the area. A mother and its calf popped up very near the boat. The Team almost immediately identifies them as EG #2791 and her new calf (find this individual and others on the North Atlantic Right Whale Catalog). Two mom and calf pairs made it to the feeding grounds, only 35 more to account for in the next two months of surveying. That's right, this past year there were more right whale births than ever recorded before. Good news to be celebrated cautiously, for the population growth still remains well below recovery levels. There are many things going on in the Bay of Fundy in addition to right whale surveys. We heard an emergency broadcast that there was a severe storm packing 60 mile per hour gusts of wind in Passamaquoddy Bay. The storm was close enough for us to see but far enough away to monitor and stay clear of. The Bay is a unique place and during the many hours of survey we get to see harbor porpoise, gray and harbor seals, white sided dolphins, shearwaters, storm petrels, phalaropes, schools of tuna and even basking sharks which we occasionally see breaching. Many species sightings are recorded and the information shared with other research teams. There is not a day without some sort of surprise. Today we had a couple. While on watch I saw an odd shaped animal in the water that I was hard pressed to identify, and we actually slowed down to investigate. Upon closer look it was a large gray seal with a good size fish hanging out each side of its mouth. It was nonchalant as it slipped away with its prize leaving us wondering what it would do with such a catch. The other surprise came on the way in. We called it a day when the wind began to strengthen and the weather on the horizon looked unpredictable. We headed diagonally across the survey area straight for North Head on Grand Manan Island, the quickest way home. We sighted and documented one more right whale on the way making a total of six for the day. We even saw two more right whale flukes in the distance leading us to believe that the Bay was starting to fill up. But for a couple of hours we could see on the horizon, toward Grand Manan, multiple high straight blows from a group of finback whales, the second largest whale in the world. We had to investigate this spectacle. Soon, voluminous blows of about twenty finback whales surrounded us. The videos are sufficient comment about the experience. We packed up the Boston office into our truck early Monday morning and headed north. Various cars packed to the brim showed up at the Lubec, Maine field station (photo album here) throughout the weekend. It always takes longer than expected to brush away the cobwebs and establish a functional office after the house has been dormant most of the winter. But we didn't have much time to acclimatize before jumping on the boat the very next day. We were worried the weather wouldn't be conducive to surveying since there has been so much fog here over the past week, so when Tuesday, August 4, looked clear we grabbed the opportunity to get out on the water. After a long debriefing in boat safety and a few practice drills, we headed south out to the Bay of Fundy past Grand Manan. It was a beautiful day out on the water despite the thin layer of fog early in the day making it hard to distinguish a blow. When our visibility was reduced considerably (less than one nautical mile at times) we would sit stationary for a period, and set up a listening station. Shutting down the engine, the blower and inverter so there was no interfering noise we would all sit in the midst of the fog and listen for blows. In fact it turned out that the Bay was relatively quiet and we were worried that we would get 'skunked' (have no sightings for the day). Reports from locals suggested that there was nothing but a few fin whales around, and only a small number of right whale sightings a couple of weeks ago. However, in the last hour we had a sighting of a mom calf pair (EG # 2145 and calf). It was very exciting for me to see the pair and know that they had made the long migration successfully. Mom had a lot of mud on her head (see image) which may be an indication that she had been feeding on the ocean floor. Since I have a lot more experience observing these whales in their southern calving grounds where they do not feed, it is interesting to witness them performing different activities. Right whales are typically skim feeders but their food source (copepods) are found much deeper in the water column here in the Bay of Fundy and so it is not uncommon to see whales come to the surface with mud on their heads. It is good to see #2145 up here so early starting to fatten up after her extensive fasting period. She certainly deserves it after travelling approximately 3,000 miles, giving birth, nursing, not feeding the entire time, and with her 2009 calf close by her side, hopefully picking up a few hints along the way. On the ride home the fog had rolled back in, so we relied on our radar and the crews' navigational skills to get us safely back to the dock. The next day brought more thick fog and so we caught up on data protocols and organizing the office. Luckily Friday looks to be giving us great conditions and we should get back out to see who else is in the area. We will keep you updated on all our latest news and look forward to your comments, but that's all for now. You can search for all of the individual whales mentioned in this post on the North Atlantic Right Whale Catalog.